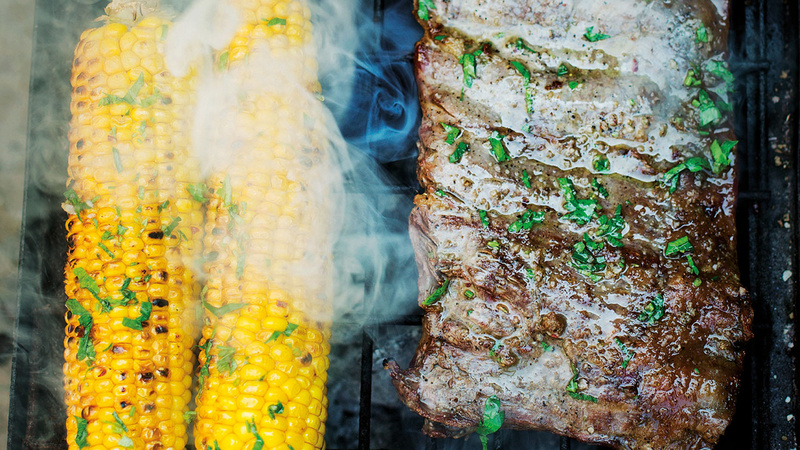 "Some people BBQ corn from raw in the husk but I find it just stays a bit too chewy," says eco-chef and Foodism columnist Tom Hunt. "Parboiling it gives you the best of both worlds with succulent juicy kernels and good BBQ taste. Always use lumpwood charcoal, as it is cleaner for cooking, giving a much better flavour." In advance bring a large pan of salted water to the boil. Remove the husk and ears from the corn. Keep the husk to use as a serving plate. Boil the corn for 8 minutes with a lid on. Allow the corn to cool. Light your BBQ using plenty of coals. Wait till the coals are white hot then spread them out evenly. Roll the corn in light olive oil and season with salt. Char the corn till it blackens slightly in places then turn and cook evenly all over. Cooking time depends on the heat of your BBQ so cook with your eyes. Serve simply as it is or dress with chimichurri. Chimichurri gets better with age so make it first. Mix all the ingredients together and put to one side for the flavours to mellow. Light your BBQ following the instructions above and prepare the corn. Season the steak with plenty of salt and pepper and rub it well with light olive oil. BBQ the corn at the same time as the steak. This should give us enough time to cook the steak and allow it to rest. Allow the steak to colour and slightly char on one side then turn and char too. If you like your steak rare you should remove it from the direct heat now and allow it to rest. If you like your steak medium then turn it twice more and cook for a further minute each side then rest for a few minutes. If you like well done steak I'd recommend asking your butcher to butterfly the steak into a thin steak for quick cooking. Once rested slice the bavette across the grain. Serve with the corn both smothered in chimichurri. The Natural Cook by Tom Hunt (Quadrille, £20). Photography: Laura Edwards. For more information: tomsfeast.com. Check out Tom's monthly seasonal produce column in each issue of Foodism.